Is Disney Trying Too Hard? We, as a generation, love Disney. Let’s admit it. Most, if not all of us, have seen at least one Disney movie in our lifetimes. If not, go to your local cinema and you will probably find at least two Disney films playing that day. Since its founding in 1923, Disney has made many dreams come true both in reality and on the silver screen. In 1937, their first motion picture "Snow White and the Seven Dwarves" was released and began an era of fantasy that has yet to come to an end. Disneyland and Disney World are still highly frequented as vacation sites for families, groups and single individuals who are looking to relive the magic of their favorite childhood movies. However, my question is, are they trying too hard and spreading themselves too thin? Since its creation, Disney has produced 56 "classic" animated feature films. Nowadays, it seems as if every movie that comes out is branded as Disney and even more films will seem that way in the coming years. Since its creation, Disney has produced 56 "classic" animated feature films, the most recent being the family-favorite "Moana." That number does not include the live-action films they have released since 1923, such as "Old Yeller," "Enchanted" and "The Parent Trap," nor the Disney/Pixar movies such as "Finding Nemo" and "Coco." It also does not include their direct-to-DVD releases: examples being "The Lion King II: Simba's Pride" and "The Little Mermaid: Return to the Sea." Disney has since expanded their dynasty through the acquisition of many of their competitors by use of multilayer deals. Some of Disney's more well-known deals include their acquisition of Pixar in 2006, Marvel Studios in 2009, Lucasfilm in 2012 and most recently, Twentieth Century Fox in December 2017. They also have a stake in ABC Studios, which has given them a foothold in the television world since 1996, which has allowed for the collaboration that made "Once Upon a Time" bring in favorite and well-loved characters. These business deals have given Disney multiple sources to create content that will last for years. However, this could be viewed as a downside because Disney no longer has the competition they were once motivated to outdo. They no longer have the need to improve because their existing formula has attracted individuals from multiple generations. At the same time, is Disney overdoing this strategy? The creation of films and theme parks may bring in a steady cash flow, but costs millions of dollars. Perhaps Disney believes the benefits outweigh the costs, but at the same time, given the current state of the economy, those benefits could be very slim in the long run if less people can their products and services. But then again, this is only speculation on my part and could possibly never come to fruition. After all, Disney’s theme parks survived during times of economic strain before — economic crashes have not hindered all parents from sharing the "magic" of the parks with their children. In another vein of thought, Disney is also attempting to create their own streaming service that will launch during the fall of 2019. As of Feb. 8, 2018, Disney has stated that they plan to create original content for this service, while leaving their more violent Marvel-based television adaptations on Netflix and their adult-inclined features will begin to appear on Hulu. They are also preparing to expand upon hits such as the "High School Musical," "Star Wars" and "Monster Inc." franchises. 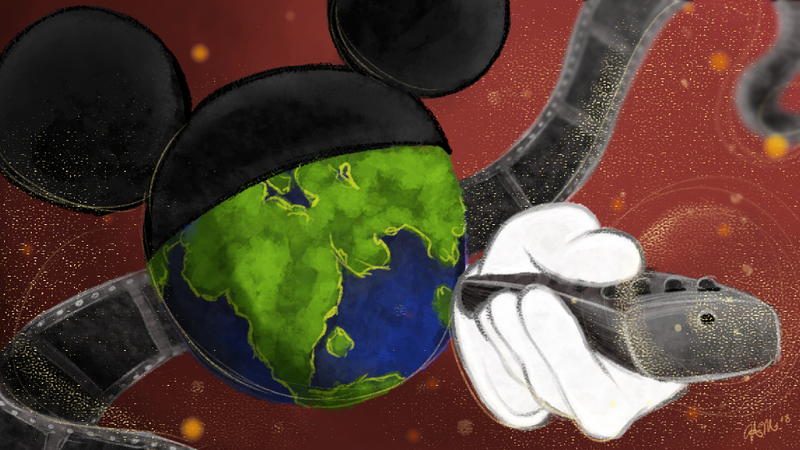 Disney eventually plans for the streaming service to go international, though it will be released in America first. Now, the main question is, when will the ideas that Disney seems to pull out of thin air suddenly evaporate? They seem to be recycling old ideas, such as live-action movies of their animated classics — movies such as "Cinderella" and "Beauty and the Beast." While these remakes were certainly visually stunning or marvelously directed, they were also simply used ideas. Animated films are not the only thing on Disney’s radar that are being targeted for revival either. We also have the remake of "Mary Poppins" to look forward to, as well as a never-ending slew of Star Wars media as "Solo: A Star Wars Story" is set to premiere on May 25, 2018. Is Disney overconfident that people will continue to spend money on remakes when they can re-watch the originals to relive the same magic? And what if the remakes aren’t as good as the original? That’s always the risk with with reinterpretation of a source material: it could be worse than its progenitor. There will always be individuals who believe that to be the case. Disney was lucky with "Beauty and the Beast" as well as "Cinderella." It’s not a guarantee that they will be successful with the live-action remakes of "Mulan," "Aladdin" and "Dumbo." With all of that being said, I will probably be one of the first souls staked outside a cinema as Marvel’s "Infinity War" premieres in May. My enjoyment of Disney’s productions has not waned since I was a child and I will be the first to admit, no matter what happens, I will be one of many people in line to watch a new Disney release, especially anything to do with "Star Wars" or Marvel. Princess movies are also a guilty pleasure of mine — I mean, who doesn’t love "Moana"? Disney has created blockbusters that have survived for nearly a hundred years and have breathed new life into series long since thought to be dead — take "Star Wars" for example. I hope they keep producing movies long into the future, but, at the same time, I will always be asking myself: when will Disney overextend itself? Writer, Artist, Dreamer, Questioner, Tea/Coffee Enthusiast, Fan and Seamstress. Television You Should Be Watching: "Buffy the Vampire Slayer"
Television You Should Be Watching: "Stargate"